Size: 7.5" x 7.7" x 3.2"
The TI-5038 II followed the TI-5038 and uses a similar housing. Nevertheless changed the specifications significantly: The display size was reduced to 4 lines of 10 digits and the storage capacity decreased to 45 lines. The pocket sized TI-5028 sports the same specifications. Don't miss the huge TI-5048. The internal construction of the TI-5038 II is pretty simple and makes use of a Toshiba single-chip microcomputer. The design of the TI-5038 II still matches with the TI-5021 introduced already in 1988. 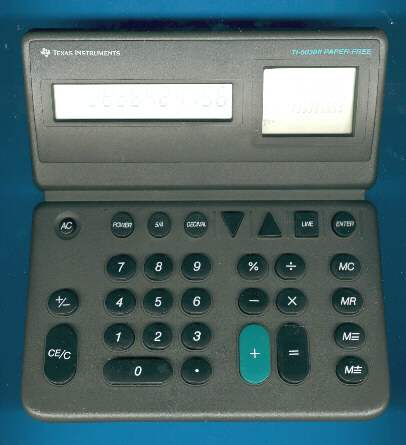 The TI-5038 II is featured in the Texas Instruments Incorporated sales catalog CL-1233 dated 1994. © Joerg Woerner, June 24, 2002. No reprints without written permission.